Toss the zucchini with 1 teaspoon salt and set it aside in a colander for 20-30 minutes. Rinse briefly and squeeze dry. In a 8 to 10 inch wide skillet (non-stick or a well-seasoned cast iron pan works best), warm olive oil over medium-high heat. Add the zucchini and cook stirring often, until it’s dry and flecked with gold in spots, about 6 minutes. Transfer zucchini to a bowl and wipe out the pan. Preheat broiler and adjust rack 4-6 inches below broiler. Beat the eggs with a few pinches of salt and some pepper, then stir in the garlic, zucchini, fresh herb and cheese. Add the remaining oil to the pan and when it is hot, add the eggs to the pan. Lower the heat, cook for a minute or so, then give the pan a few jerks to make sure the eggs are loose on the bottom. If they are sticking, loosen them carefully with a thin rubber spatula. The thicker the frittata, the more slowly you need to cook it so that it will cook through without burning. Cook over medium-low heat until the eggs are set and the top is nearly dry, about 10 minutes. Put the frittata 4-6 inches under the broiler to finish cooking the top. 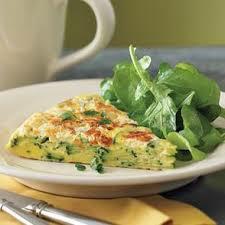 Remove and invert the frittata onto a serving plate.